Place eclipse glasses or welder’s glass over a cell phone to photograph a solar eclipse. Most of the solar eclipse photographs you see online and in the news were taken by professional photographers using digital cameras or telescopes, tripods, and filters. Often, many pictures taken under different conditions are combined to make a composite image that shows more detail that you could get from a single photo. While this type of photography is fun, it’s expensive and time-consuming, so you might miss truly experiencing the eclipse. Don’t rule out your smartphone for eclipse photography. With a little planning, you can take great pictures without any special equipment. You definitely shouldn’t view the eclipse without an eclipse filter until it reaches totality. Your phone, on the other hand, can probably withstand brief exposure to direct sunlight. You’ve likely photographed sunrises and sunsets without a problem. However, there are two reasons why you don’t want to point your phone at the Sun before an eclipse is total: (1) The image will look like the plain old ordinary Sun and (2) Newer smartphones with larger lenses could potentially be damaged, plus you need to look toward the Sun to take the picture, risking your eyes. Before the Moon completely covers the face of the Sun (and also after a total eclipse), you can use your phone to take a picture by placing eclipse glasses, a solar filter, or welder’s glass over the phone camera. Don’t use sunglasses. Sunglasses won’t protect your phone and won’t darken the Sun enough to produce a good image. Using eclipse glasses, the resulting picture will be very dark, showing only the crescent of the Sun, so there’s no point trying to include people or scenery in this type of photo. While it is a good idea to photograph the area, your friends and family, etc., do that using ordinary settings and expect a normal sun. 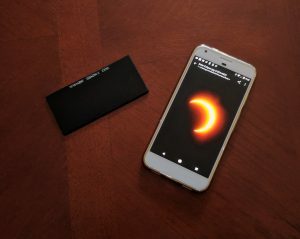 Smartphone eclipse photographs taken using eclipse glasses over the phone typically show an orange sun against a black background. If you use welder’s glass, the Sun will most likely appear green on a black background. During the total phase of a solar eclipse, you don’t need a filter to take a photograph. In fact, using one may darken the Sun too much to see anything at all. Autofocus and autoexposure work just fine. Use image stabilization, if it’s available for your phone. You can download an app if you want to play with ISO and shutter speed settings. Because the eclipse is relatively small and dark, expect the best pictures to be taken with a tripod. If you don’t have a tripod that accommodates a phone (or don’t want to lug one around), rest the phone against a stationary object to stabilize it. Most smartphones take JPEG images, which can be grainy when you zoom in on them. You can shoot in RAW format to preserve fine details. To do this, download a manual camera app, such as a ProCam or Halide for iOS or Camera FV-5 or Manual Camera for Android. Zooming in on the Sun to take a picture typically results in a grainy image. A better option is to use a telephoto lens attachment made to work on your phone. Examples of these products into Moment, Photojojo Iris, and Olloclip. Finally, practice your technique before the day of the eclipse. While you can’t simulate a total solar eclipse, that part of the process (at least with a phone) is pretty easy. Point and click. For the part of the eclipse leading up to and following totality, practice using eclipse glasses or a solar filter on the normal sun. You might even get a cool picture of sunspots!